Roam-Raster continues Berlin’s contemporary narrative as a city and site which challenges hegemonic social and political conditions by democratizing boundaries within the school. 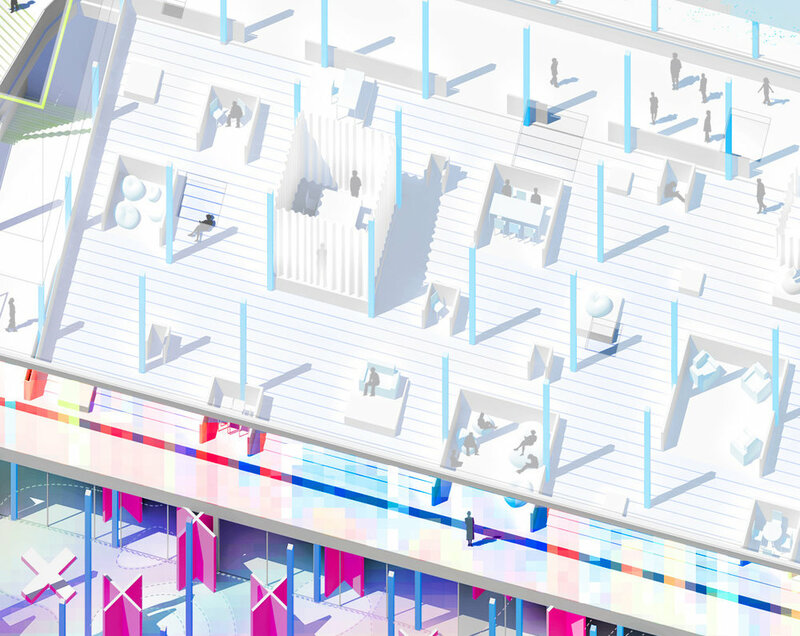 Moving away from the hierarchical dynamic of teacher and student, Roam-Raster puts forth a new pedagogical model of built form and spatiality in order to make the theme of a school without classrooms a physical and viable option for the 21st century. Inspired by the ancient Athenian tradition of a roaming educator, e.g. Socrates, Roam-Raster’s innovative theme and programming emerge by facilitating a freedom of location (free plan, free circulation) within the context of two squares. The two squares modify the traditionally closed classroom by utilizing figural and interactive columns, expressed in magenta and cyan, to imply spaces for gathering and learning. Further, the spaces where the two squares overlap create a third environment; one where students attend to the academic curriculum at their own pace while their teachers are mobile to answer questions. Color is used as a programmatic and aesthetic device to further emphasize the notion of breaking traditional educational boundary conditions. Borders, walls, and lines (read: vectors) which normally define stable programmatic zones are converted into pixel data. The concept is that space no longer has distinct programmatic identity, but is rasterized. This facilitates programmatic reciprocity as teachers and students roam through a contiguous learning environment. Last, the overlapping squares and their subsequent columns produce a landscaped collaborative zone which in turn has the potential to alleviate emotional and psychological inhibitors and produce an original environment with a clear design sensibility to foster a productive learning experience. Roam Raster placed Top 50 of the 400+ entries for the international competition featured by Archasm.